1. How is a FirstDay built? FirstDays use a completely unique building style specifically designed for owner-builders. The structure is made by laminating high quality standard lumber into posts and beams. The frame is then erected in a series of bents which are then tied together by the sheathing and decking (where applicable). The sheathing becomes the interior finish of the house. The sheathing is then covered with building wrap, foam insulation, strapping and siding. The whole house can be completed by just two people. Because of this unique building system which uses no plywood or sheetrock, the house stays sturdy and still looks great even if it is not perfectly square and true. 2. What makes a FirstDay last? We think a FirstDay Cottage will last for 300 years. Why? First, a house is preserved if it is attractive and elegant. Look at a 300-year-old house, it is attractive. The proportions are correct. Second, the details used in construction must last. We don't use plywood or sheetrock, and the structural design is redundant in many places to ensure lasting strength. The structure and interior breathes to the inside, and exterior siding and roofing are hung on an air space to also breathe. This helps prevent moisture buildup and helps the materials last. Third, the house must withstand abuse. Our all-wood interior can take it. Dent it, scratch it, carve your name on it. Like a fine piece of practical Shaker furniture, a FirstDay becomes more elegant with age. 3. Is a FirstDay energy-efficient? You bet! FirstDays tend to be small, and are very tight and well insulated. The walls and roof of a basic FirstDay can be insulated to anywhere between a R-13 and a R-40. The effective R-value is higher than typical home construction, because the insulation is continuous and covers the entire outside of the home, with breaks only for windows and doors. In addition, we find owner-builders are very dedicated to sealing up the house and making it tight because they are the ones that have to live in the house and pay the energy bills. We use a closed cell foam and building wrap to keep the house tight. The insulation package we provided is flexible, so we can include more or less foam depending on personal preference or local codes. We can show you how to heat a FirstDay in New England for about $300 a year. You're just not going to do much better then that unless you chop your own wood. Note: Although most FirstDay Cottages can be heated cheaply and efficiently with the standard 2" of high-R foam, local codes may require additional insulation. For details on requirements in your region, or for a quote on extra insulation, please call for more information. 4. How do I design a FirstDay Cottage? 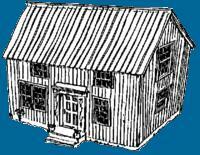 Firstly, the house must be one of our four basic designs: The Single-Story T, Original 1 1/2 story, the Saltbox or the Cape. This sets the width and cross section of the different components of the house. Now realize that a FirstDay is constructed of a series of bents, each 3' 4" on center so the length of the house will be determined by how many bents you have (usually 6-12 bents giving 20'-40'). The opening left between each bent is sized for a window, a door, or a staircase. Now look at some of the floor plans. We've only begun to show you different layouts that could be built with a standard kit. Put four windows together. Add a porch. Try to interpret the way you live. And then remember that you can always add on someday. Think of circulation, the sun, the wind. Think about privacy. Remember that children grow up and become teenagers. Getting complicated, isn't it? Maybe it's time to call us and get some help. We draw up custom plans for each FirstDay. We suggest future additions. We have over 20 years doing this. Try your own ideas, then call us for a few more or send us your sketches and we will comment on them. 5. How flexible is the design of a FirstDay? Every FirstDay has a "standard" frame designed with custom infill. Each house has a custom floor plan, but most kits contain a very similar collection of materials. Typically, you change the count of windows and doors, type and number of cabinets, and roof color. We will customize the structure for different designs, foundation types or to meet different codes. We can also add additions or porches that will fit with the system. There are extreme limitations for changing the width of the basic designs or raising ceiling heights. For any house that requires changes to the basic frames a design fee might be added to the cost of the kit. The new Single-Story T design system allows for some especially unique and clever designs. Send us your ideas and we'll help you develop a final design. 6. What type of foundations do FirstDays have? We recommend to all of our clients to put their FirstDay on a radiantly heated slab. This drastically lowers the cost (a full foundation can cost almost as much as the kit itself) and simplifies and shortens the building process. However, if you need additional space and are up for the challenge and extra cost, every model can accommodate a full basement. Whether on a slab or a full basement, we recommend setting up a simple radiant heating system in the concrete of the floor. This will help keep the basement dry and the concrete floor warm under your feet. We can guide you through the installation of an effective and inexpensive radiant system. Besides these standard foundations, FirstDays can be modified for almost any foundation type. Call for more details. 7. If I do build a basement, can I put rooms in the basement? Most FirstDays have full basements, many with livable space. With even the slightest slope, we usually expose part of the basement wall with full sized windows or even an exterior door. This lets daylight into the basement, and we usually encourage a basic source of radiant heat in the slab. A heated floor not only keeps your feet warm, but also keeps the slab from retaining moisture, so the basement won't be damp and dismal. We'll show you how to install the radiant tubing and hook up an effective yet inexpensive system. In most cases you can fit at least two small bedrooms and a full bath in the basement. With a livable basement, you can expand our smallest houses to over 1,300 square feet. It gives teens privacy, or you can add a playroom or workshop. We expect everyone will eventually add onto their FirstDay. You don't really need to - most families in the world live in homes much smaller than FirstDay. If you do want to expand, we have kits for various sizes and types of added space. The most common addition is a 15' x 20' vaulted ceiling open room to one side or a master bedroom wing. We don't recommend doing a large house to start. It's just too much work. As you run out of steam and the costs go up, the project is in danger of failing. Build a basic house, settle in, then put on the addition a couple of years later. In the meantime, you will be living in a finished house that is comfortable and usable. You can also apply your hard earned equity from the first stage to help finance the addition. Remember a finished 1,000 square foot home is worth a lot more than an unfinished 2,000 square foot home. When you build a FirstDay, we can draw you plans of how a future addition might work. 9. What type of wood is used in a FirstDay? Because the interior of a FirstDay is all exposed wood, we work hard to ensure that you get superb lumber with quality that will show. The structure is all spruce. The tongue and groove sheathing is an eastern white pine which is "run of the mill" so it looks great. The shiplap vertical siding is also eastern white pine, and has a rough side and a smooth side (you can pick either to be exposed). The decking is a special 2 by 6 tongue and groove hard spruce. This wood is really good quality and also has a V groove to dress up the ceiling. All the wood is kiln dried, and the sill plates are all pressure treated. Remember that we don't use any plywood (except for some in the cabinets) and we don't use any sheetrock in a FirstDay. 10. What are the doors and windows like? The windows are double hung with a solid reinforced vinyl balance and sash. Every window has double glazed low E glass and the sash tilts to take out. All windows are pre-finished and ready to install. You can have various grill partitions for the windows or choose none at all. The exterior doors are metal and fiberglass, pre-finished and ready to install with hardware. The interior doors are all wood or molded wood, six-panel doors and also come pre-hung and ready to install with hardware. 11. What type of cabinets are in a FirstDay? All FirstDays come with pre-finished oak cabinets. We like painted cabinets - they look great in a house with all the exposed wood of FirstDay. We think you should paint it. Nobody does. Cabinets come in many different shapes and sizes and the cabinet order is customized to the design of your kitchen. We do not include kitchen counter tops since there are so many different possibilities with widely varying costs. 1. Who should build a FirstDay? At FirstDay, we like to think that we're advocating a way of life as much as trying to sell a product. The ideal FirstDay owners are people who have decided that all they need is a small cozy house, and to save money and create equity they've decide to build it themselves. For thousands of years everyone built themselves a house. Solid construction doesn't take magic or years of experience, it's just good old fashion hard work. We've spent a lot of time trying to figure out exactly who should build a FirstDay. We often discourage those raising children or people building second homes because we're afraid they don't have time, but a lot of these people prove us wrong. The whole idea of FirstDay is that special people with enough dedication and a solid plan can build one. The important thing is that you have a solid and thorough plan of how you will get it done and that you have a history of success in large, difficult projects. The truth is that we don’t have a formula for who can do this, but give us a call and we'll help you determine if FirstDay is right for you and help you develop your plan. 2. Can we really build this house ourselves? The most important things you need to finish a FirstDay are determination and a solid plan. A FirstDay is intentionally labor intensive. Nothing is precut, so the kit price stays low and the builders earn a lot of equity in the project. A basic FirstDay takes at least 600 - 1,000 man-hours to complete, while larger and more complicated houses take longer (see 4 below). Do you have the time and determination? You also will need some basic skills with wood. Can you use a power saw? Are you good on ladders? Can you hammer nails? How about all day long? Sometimes we'll recommend that you hire a little professional or unprofessional help. Say you hire someone to do 200 hours work at $15 an hour. Does that fit into your budget? We've seen FirstDays built in a variety of situations. Call us and we'll help you develop your plan. 3. Are your houses easy to build? The concepts and labor required to build a FirstDay are all very easy. FirstDays are designed for owner-builders so it can withstand small errors and still be strong and look great. The difficulty comes in the amount of work required. In other words- the work is easy, but there's a lot of it. Building a FirstDay can be long, hard, discouraging, cold, wet, slow work. You also need to focus on how well you can build the house not on how quickly you can build it, so a good attention to detail is needed. With the all-wood interior and exposed structure the better your attention to detail while building the better the finished house will look. It is a lot easier to watch TV than it is to make the show. FirstDay is for people who want to make the show. 4. How long does it take to build a FirstDay? We say a small FirstDay Cottage home on a slab (e.g., a 680 ft2 Single-Story T) can be built in 15 weekends, but we need to cover our idea of a weekend. We expect you'll get in 4 hours on Friday evening, and then 10 hours a day on Saturday and Sunday. To finish a FirstDay that quickly you need to be the kind of person who will work consistently and eat lunch with a hammer in one hand. It is really a lot of work, so you need to be really dedicated to putting the time in and staying on track. We insist that you try and finish the construction in six months, because after that you will run out of steam. We get concerned with people who take a lot longer than that, but many of our customers building larger houses have successfully built in a year or even longer. The important element is that FirstDay is here to support you and make sure your project is a success. Look at it this way. There are 8,760 hours in a year. For one person 2,920 are spent in sleep. 2,000 are spent working. Of that remaining 3,840 hours, 1,000 of them will get you a new FirstDay Cottage, substantially increasing your net worth and providing a home that you can be proud of and be very pleased to live in. If you have two people to build it, that's only 500 hours a piece. 5. Can I hire a contractor to build my FirstDay? You can hire a contractor, but be extremely wary. FirstDay was not designed as a contractor built house. The system of building is completely different and is designed for someone who has no idea what they are doing, not for someone who thinks they know everything. Also remember that FirstDay is a very labor-intensive project. With contractors, labor costs money - sometimes big money. Expect a bill of $15,000 to $30,000 just for the labor to put the kit together. We often recommend hiring good workers that are not professionals. In many cases they will work faster and cost less than a contractor, and most importantly they will read the instructions and do it right. 6. Should I get my friends and relatives to help? "Uncle Ned was a carpenter once . . ." Don't count on it. Building a FirstDay isn't a party for your friends and relatives. Friends and relatives usually are more of a distraction than they are effective laborers. Are you a good boss? Can you ask free help to work long and hard? Will they read the directions, or will you spend the whole time teaching them? Count on doing the whole house, yourself and you'll still have friends and family left at the end. If people do help, make sure they are being an asset and not a liability. If they are a liability get rid of them. 7. Should I do the plumbing, wiring and heat? No! You'll have enough to do! These jobs are not easy, and most areas of the country require a licensed professional to do this sort of work. We know what subcontractors should charge for these jobs, and we will provide input before you sign contracts. We can save you a lot of heartache and a substantial amount of money. 8. When do I get my custom plans? We will give you sketch plans and quotes in the beginning. We do this so you can put your ideas together and come to a definite decision of whether FirstDay is right for you. Often we will send plans of a house that is similar to the design being considered. With these, people can get financing, quotes on foundation, plumbing, wiring, etc. When everything is in line and you're sure you want to build, we take a $2,000 deposit and we develop custom plans for your house. The final design process can be a long one. After going through a few iterations, a final design is reached and you will get the custom plans along with a final quote for the price of your kit. 9. What is in the kit? We like to say that the kit contains everything you need to build the house except: the foundation, plumbing, electrical, heating/cooling, kitchen counter top (cabinets are included) and any paint or stain. There is also about $100 in miscellaneous tubes of caulking and odd nails or screws that are not included. The following is a basic list of what is included: beams, posts, sheathing, decking, (floor and ceiling), insulation, roofing, doors, windows, siding, nails, strapping, building wrap, kitchen cabinets. More information can be found on the "More Info" page. 10. What tools do I need? You'll need a good electric circular saw and basic carpentry tools: hammer, square, apron, handsaw, and tape measure. You might want to get a cheap table saw ($150). You can rent ladders, wall brackets, and scaffolds. Don't waste a lot of money on fancy tools. You don't need a pickup truck so forget about buying one. Building a FirstDay shouldn't be an excuse to buy more toys. We also discourage the use of nail guns. They can be dangerous, and we want you to focus on how well you can build the house not on how quickly you can build it. With a good hammer, a tape measure and a good electric saw you can finish almost the whole house. 11. How do I know how to build it? Along with a custom set of plans, you will receive our instruction book (2 copies). These instructions are amazing to us, because they really work. They were written assuming that this is the first big thing you have ever built. You'll be alerted to possible errors, and you'll be encouraged to call us if you get into trouble (or hopefully before you do). Before you buy our kit, you'll get a chance to go over the instructions and can even talk to someone who has used them. We like to think of our book as 80 pages of anticipation and encouragement. 12. How do I unload the kit? The kit is big. It fits on a 40' flatbed trailer and weighs 35,000 lbs. You can hire a forklift to get the big bundles off. You must arrange to do all this in just four hours. The truck and driver can't wait all day, and typically the driver isn't allowed to help with the unloading. We will provide you information on how to keep the wood and other materials protected throughout the building process. 1. When should I talk to the people at FirstDay? Right away. We are a support team. We can give you advice about buying land. We'll teach you about wells, septic systems and driveways. We're happy to look at any sketches or plans you have, because it's the quickest way for us to become familiar with what you want. We will then respond by sending you a sketch of our own, which will take your ideas and adapt them to FirstDay. Talking with us is the best way to determine if FirstDay is right for you. Start with us in the beginning and you'll find a personal contact that will work with you from beginning to end. 2. How do I visit the FirstDay company? If you want to visit us, we encourage it. We have several FirstDays very close to us. We live and work in a charming New England Village in southwest New Hampshire. Come and visit and spend some time talking about FirstDay. We have models, photographs, house plans, and sample materials. We will talk about design. We'll take you to see a house. But make sure you call first. We're not always all here. We are two hours from Boston, four hours from New York City and are only one and a half hours North of Bradley International Airport in Hartford, CT.
3. Can I visit a FirstDay Cottage near where I live? We can arrange for you to visit a FirstDay if there is one in your area. You can see if there's a FirstDay near you by looking at our map of FirstDays around the world. Give us a call, and we will contact the people who will be your hosts. We insist that you take your hosts a nice present, because in most cases your hosts will be spending half a day with you. Bring something special such as a really good bottle of wine or a nice book. You will find that most FirstDay owners are extremely hospitable and are excited to share their story. Respect their effort and share their pride. 4. How do I finance FirstDay? Most people finance FirstDay through local conventional means. Those that encounter resistance will get help from us. We can help guide you to various banks or co-ops. We can also talk to the bank and send them information to help them believe in the project. When you go to banks or lending institutions, they always have a lot of questions, and we've answered them all. Remember that bankers and other lenders are in competition with each other. Visit lots of them and make them compete for your business. If needed, we will also give you advice on how to hire an "associate contractor." Some banks like to have a licensed professional involved on the job. As a rough quote, we tell people the basic kits cost roughly $33 a square foot. Since every house is different this number changes from design to design. The kit for single story additions or structures cost roughly $35 - $50 a square foot. Our customers have found that the finished cost of the house (not including land or site improvements such as septic or driveway) is about twice what they pay for the kit. However, if you build a single story house on a slab this should be cheaper. So budget ~$33 per square feet for the kit and another $33 per square foot for the foundation, plumbing, wiring, heat, etc. These numbers are rough, but should help you with budgeting. We can help you refine these numbers if you send us a proposed design. 6. What are shipping costs? Shipping is charged at cost by a 3rd party carrier. Please contact us for an up to date shipping quote to your building site. A whole kit is typically shipped on a 50' trailer. For local deliveries, we often ship in a few stages on smaller trucks. Call us about taking delivery in midwinter and we’ll probably give you a discount. 7. How do I order a FirstDay? When you decide to order, send us a $2,000 deposit, and we'll give you a contract for our kit and begin working with you on your final design. After the design is done, you can expect a final quote on your kit. We then need three weeks final notice to package and ship the kit. The balance, in the form of a certified check, is due three weeks before the kit leaves our yard.